Bosnia-Herzegovina captain Edin Dzeko is set to miss their Euro 2016 qualifier against Wales on 10 October having been ruled out for four weeks with a knee injury. The striker, 29, twisted his knee as Roma beat Carpi 5-1 on Saturday. Dzeko, on a season-long loan from Manchester City, is Bosnia's all-time leading scorer with 44 goals in 74 games. 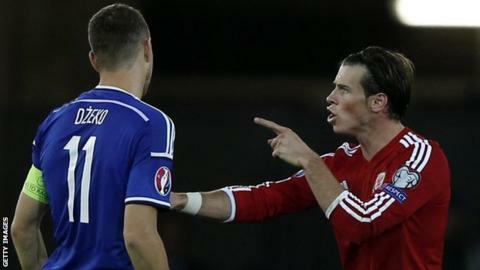 A draw against Bosnia in Zenicar would see Wales qualify for Euro 2016. Chris Coleman's side are currently top of Group B and end their qualification campaign at home against minnows Andorra on 13 October. A point in either match would be enough to seal their place at Euro 2016, which would be Wales' first appearance at a major tournament since the 1958 World Cup.